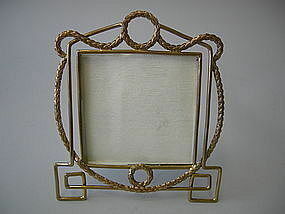 An Antique English Brass Wire Picture Frame consisting of a plain brass wire formed in a geometric design overlapped with a figural acanthus leaf wire formed in a circular design with two decorative wreaths. Made in England. Circa 1910. Very Good Condition. 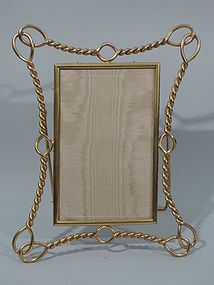 The frame stands 6 ¼ in. tall and measures 5 ½ in. in width. The square interior insert measures 3 5/8 in.